Several Suffolk politicians are working with AARP to help make the county age-friendly. July 31, 2013 - Hauppauge, NY - Today, County Executive Bellone was joined by Legislator Rob Calarco, Legislator Sarah Anker, Mayor Paul Pontieri, and representatives from AARP and the Suffolk County Office for the Aging to announce Suffolk County’s participation in AARP’s Age-Friendly Communities program. To ensure Suffolk County’s full participation in the program, Bellone will convene Blue Ribbon Commission comprised of a representative from the Suffolk County Senior Advisory Council, senior community leaders representing each town and representatives from appropriate Suffolk County departments to review AARP’s criteria for Age-Friendly Communities as well as make recommendations for implementation within Suffolk County. “As we continue to promote economic development and an innovation economy it only makes sense for Suffolk County to support AARP’s Age Friendly Communities program as it will provide yet another platform to attract and retain residents, provide varied business opportunities and build infrastructure and policies that support all ages of residents,” stated County Executive Bellone. The AARP Network of Age-Friendly Cities is affiliated with the World Health Organization’s (WHO) Age-Friendly Cities and Communities Program®, an international effort launched in 2006 to help cities prepare for rapid population aging and the parallel trend of urbanization. The program currently has 137 participating communities in 21 countries around the world, as well as 10 country affiliates representing over 1,000 communities. 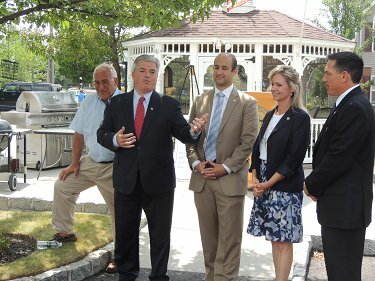 Subject: LongIsland.com - Your Name sent you Article details of "Bellone, Calarco and Anker Announce Suffolk County’s Participation in Age-Friendly Communities Program"